GOLDPoint Systems is making major enhancements to File Services Plus in order to comply with government regulations laid out in the Uniform Commercial Code (UCC). These changes allow for source documents to not be augmented except by specific personnel given security access. This will ensure “control” of documents only be given to authorized personnel, and all documents will be watermarked accordingly. 6. Any revision of the authoritative copy is readily identifiable as an authorized or unauthorized revision. 1. Security: We now require a security option that restricts users from altering source documents. 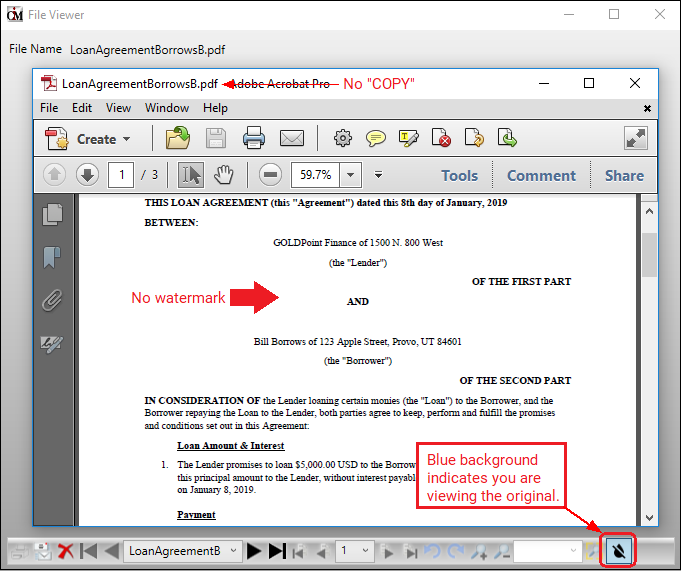 Conversely, if users are set up with that option, users can add a watermark to documents indicating that the documents are not original, as will be explained in 2, 3, and 5 below. 2. 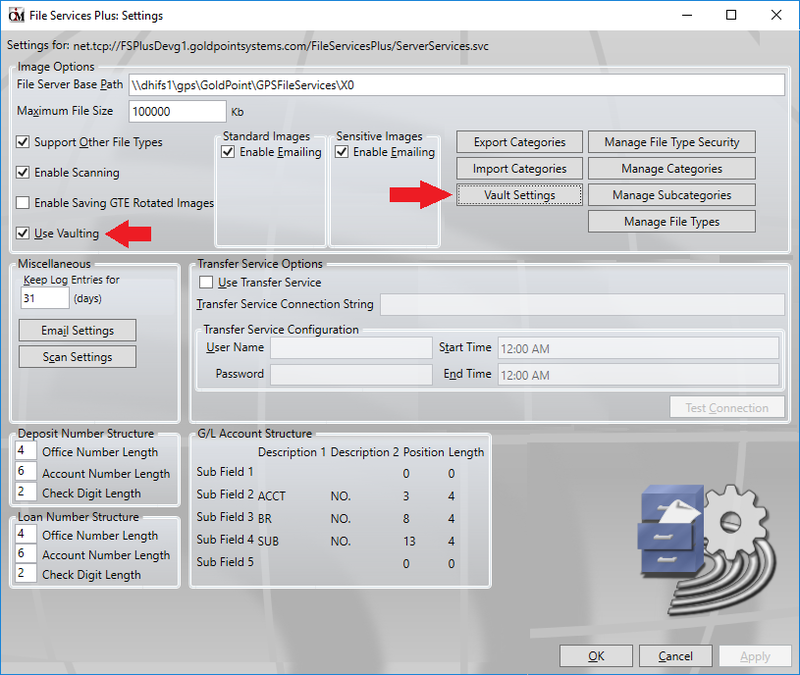 Settings: Under Settings in File Services Plus, we added a Use Vaulting checkbox. If that box is checked, the <Vault Settings> button becomes enabled, as shown below. Note: If the Security Option in number 1 above is not set to “Maintain,” the user will be unable to view any vaulting settings. The Use Vaulting box will be grayed out, as will the <Vault Settings> button. 3. Setting the Watermark: Clicking the <Vault Settings> button brings up the Vaulting Settings dialog box. This is the dialog box that is used to define the watermark displayed on attachments. See the example below. You can set a default watermark, as highlighted in 1 above. 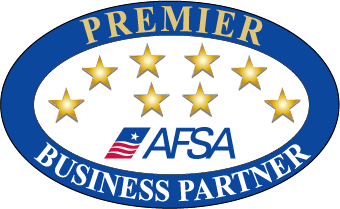 This watermark will show on all documents attached to File Services Plus. You can choose the position, wording, opacity (transparency), size, and color of the watermark. You can also set a watermark based on attachments to accounts that are backed by an investor master and group number, as defined in 2 above. 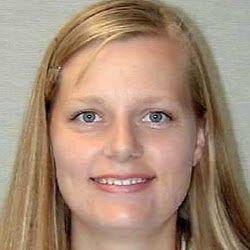 If both are set, the Specific Watermark supersedes the Default watermark. 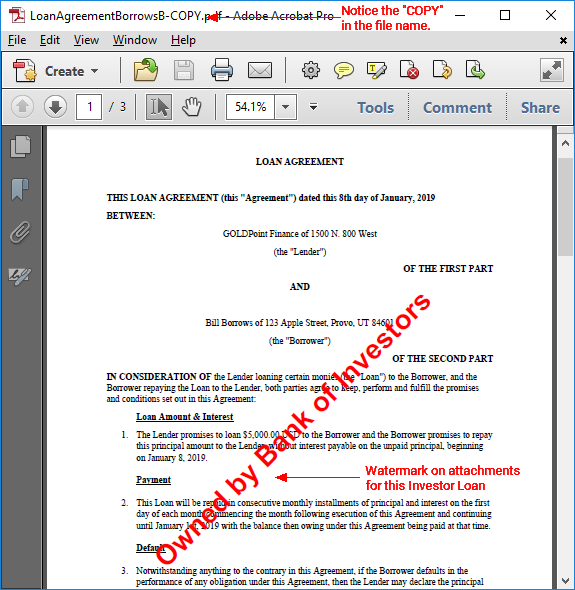 For example, if you set the Default watermark to “Copy” and another watermark linked to Investor Master 1/Group 1 to “Owned by Bank,” the system will display the “Owned by Bank” watermark on attachments linked to that investor’s accounts. If the accounts are not linked to that investor, the attachments will display “Copy” as the watermark. 4. Now any attachments to accounts will have a watermark. 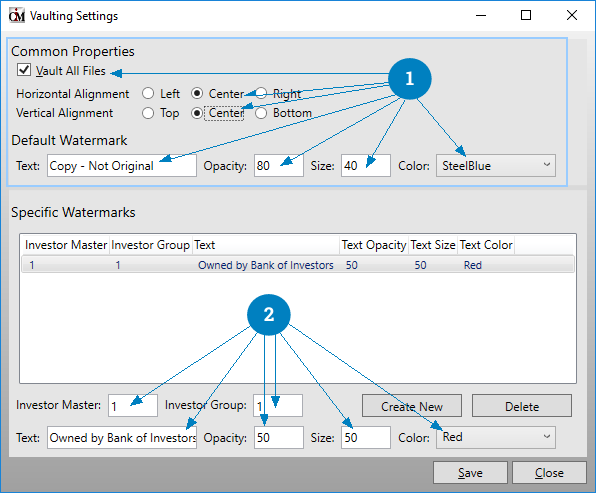 If you only wanted attachments from certain investor accounts to have a watermark, you should uncheck the Vault All Files checkbox on the Vaulting Settings screen, but make sure the Specific Watermarks for designated investors are set up. In the example below, you can see that attachments on this investor account include the watermark of “Owned by Bank of Investors” on it. Example of an Attachment Owned by Investors. The Opacity is set to “0” for effect so you can see the watermark clearly. 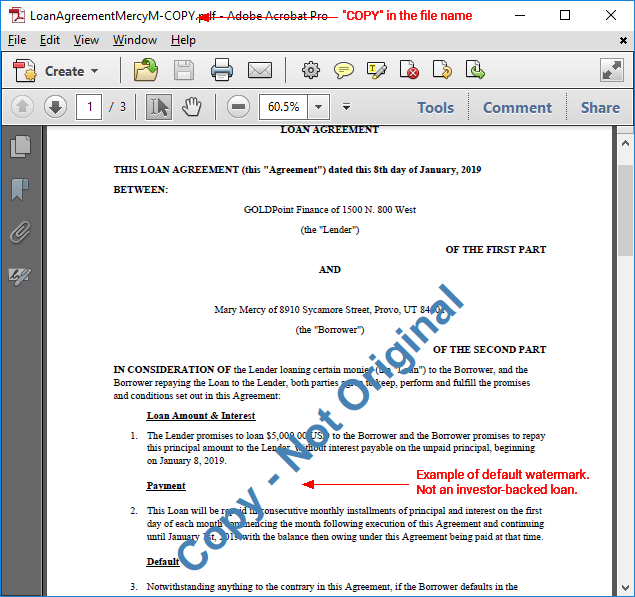 In this next example, you can see that the default watermark of “Copy – Not Original” is shown on the attachment, because this account is not an investor-backed loan tied to an investor master and group number. 5. Additionally, a new toggle is available on the View Attached Files screen called <Edit Original>. This toggle is only available for those with proper security clearance, as discussed in 1 above. If you do not have the proper security clearance, the toggle will be grayed out and only watermarked copies of attachments will be available for viewing. This toggle has a blue background color when on; gray default color when off (see below). When this toggle is on, and you export an attachment, the source documents will not have a watermark or “COPY” in the file name. We believe these enhancements will ensure control of your documents agrees with the standards set forth by UCC. Please contact GOLDPoint Systems if you want to know more details.